“Perfect placement of your air conditioning vent”, and “that air vent looks fabulous” are two phrases that have probably never been spoken and never will be. Just when you thought the iconic HVAC vent is an eye sore your home cannot live without, our clevers ways to conceal them are blowing in. 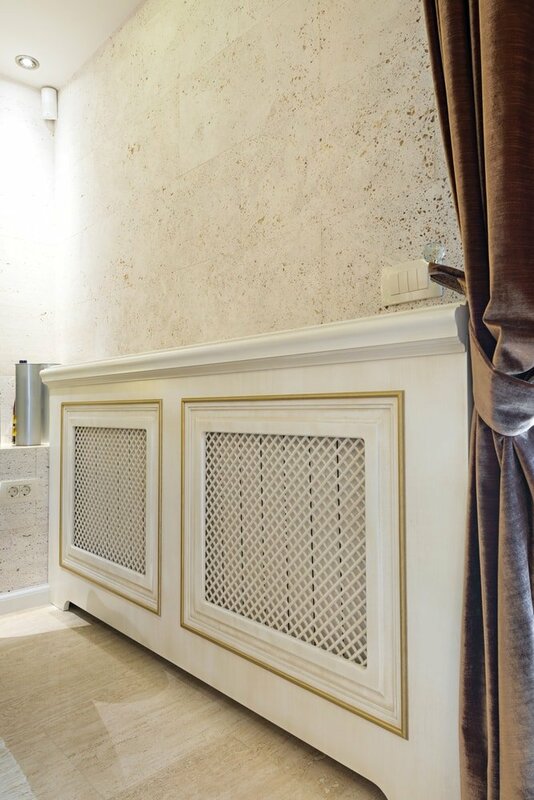 AC vents deserve the same tender, love and care as other accents and furniture in your home to achieve more matching and less clashing. HVAC systems have come a long way, but minimal strides have been taken from a design standpoint. Their aesthetic is too industrial for artistic spaces and outright outdated for modern interior design. 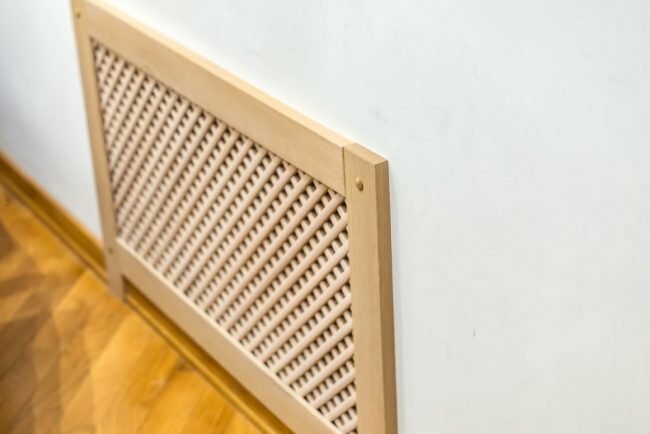 When replacing AC vents is not an option, read on to explore 6 clever and creative ways to hide them. –Very important reminder- before you start working on the cover project, remember to change the air filters with brand new ones. 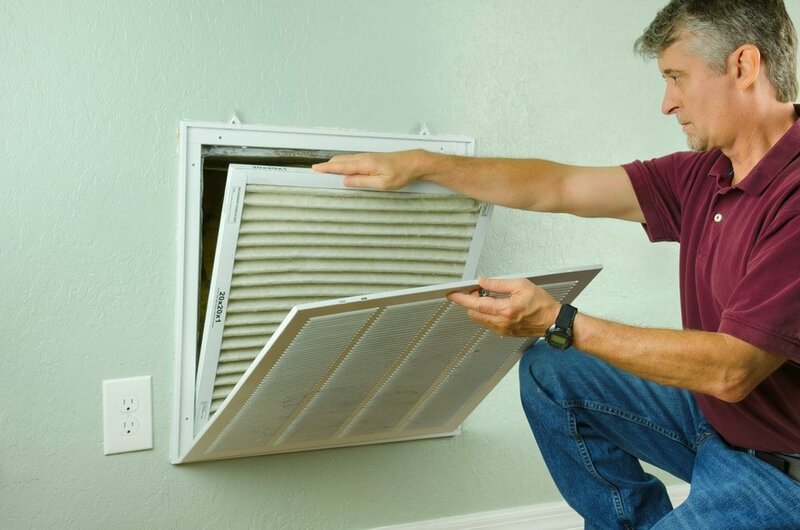 Old and dusty air filters can carry diseases and spread them like crazy and considering how a cover for the AC Vent would make the filters a little more unreachable, change them before starting. For the most time consuming, but multifunctional approach installing a shelving system gets the vote. This technique usually works only for AC vents located at the bottom of walls, but there are shelving systems tall enough to cover up vents closer to the ceiling. Try a diamond-shaped pattern for the cabinet doors with a multi-level shelf system on top that’s perfect for storing kitchen appliances such as pots and pan. A simpler version is a single shelf that sits on top of cabinet doors. Whichever option you choose, you’re guaranteed more storage space and never having to stare at ugly vents again. Slide office desks against the air vents with the back of sliding pull out drawers positioned in front of the vent if the vent is close to the ground. Make sure that the drawer has plenty of breathing space for the air to circulate. Alternatively, desks can be positioned against the wall with AC vents facing your foot area, but make sure that you attach an AC vent air deflector to reroute the air path away from your legs. 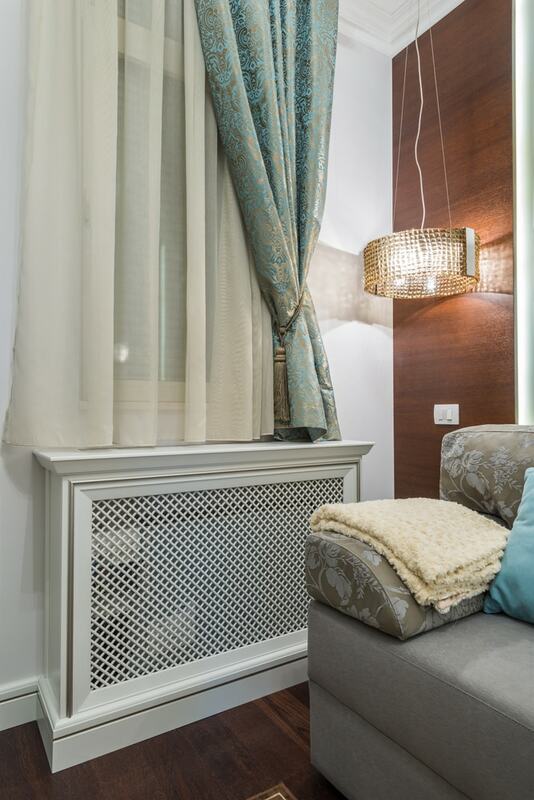 Furniture used to cover AC vents should remain functional so that you’re not wasting precious space. 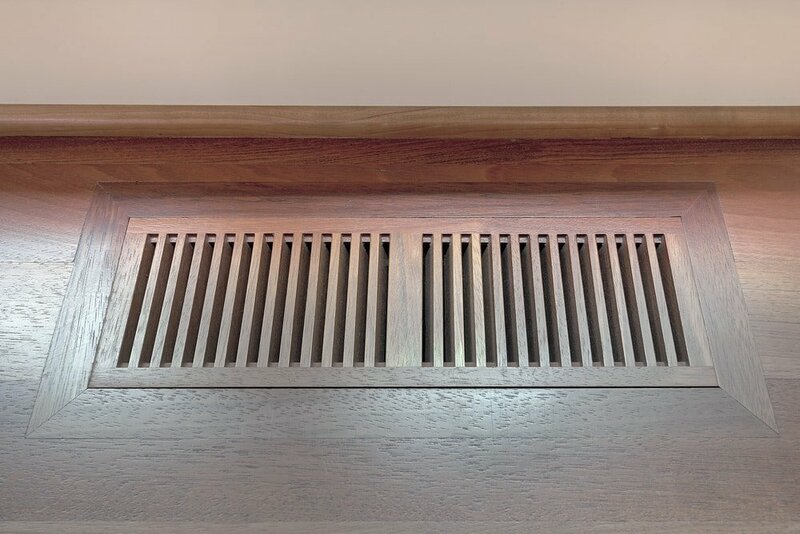 Gather up wood trim and wood glue and give yourself a couple hours to create a unique vent cover. Search for wood trim approximately ⅜” thick and 1” wide with a slight rounded edge. For a special touch, a wood lattice is a great option but you can also get creative with your own design using sheet metal. Glue the wood trim to the wall around the AC vent and then use cut tacks to nail the metal to the frame. Doormats work wonders to cover up AC vents because they are available in a variety of classic and modern scrollwork patterns. A $10-$20 budget will give you plenty of options, and any left over change could purchase a can of spray paint to transform it into a color of your choice. Remember to choose a doormat that has an open design so that air passes through. After you size it up to make sure it completely covers the vent, simply hang it on two nails above. 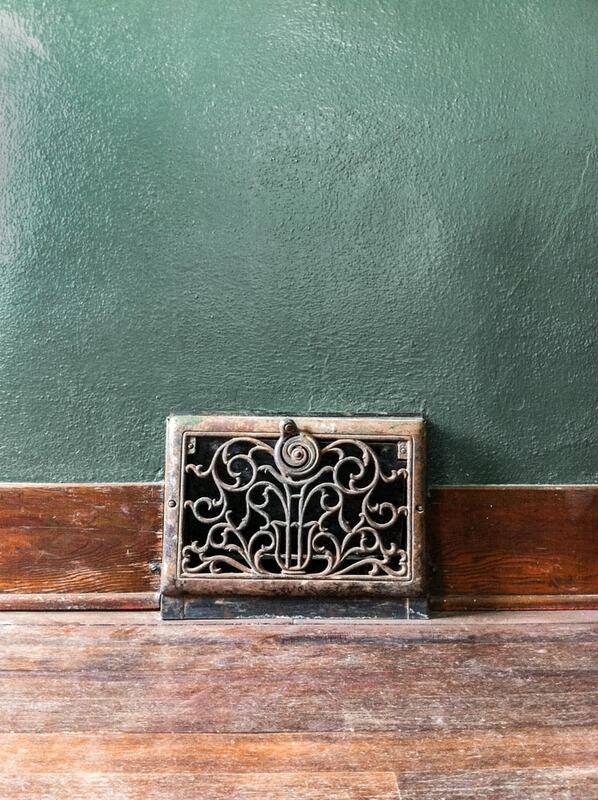 For a modern look, spray paint your vents with a metal color like gold, silver or bronze. 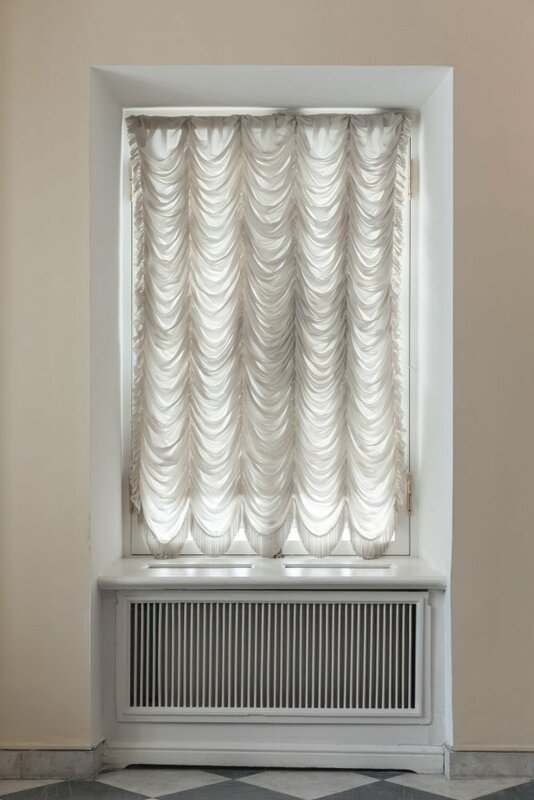 The great thing about this trick is that it works for pretty much any style of AC vent including both floor and ceiling. Remove the vent, apply the spray paint and then wait for it to dry before inserting into place. Why not use stencils in the process to spice up your designs with floral prints in the bathroom or jazzy colors for a kids room. Irregardless of disguising them, this technique also repairs rusting and chipping whilst become a new piece of wall art. Let your imagination run wild with a fun DIY project that adds a cute touch to those boring looking air vents. Whether you renovate an old fashioned key box, or create a wooden one from scratch, covering up an air vent with a mini secret door is a fabulous way to add rhythm to your home.